During my vacation in Venice, Italy, I’ve seen many beautiful buildings, sculptures en of course many boats. However, there was one item that I often came across during each walk through the city. At the many market stalls there were almost always cute pink cats hats for sale. 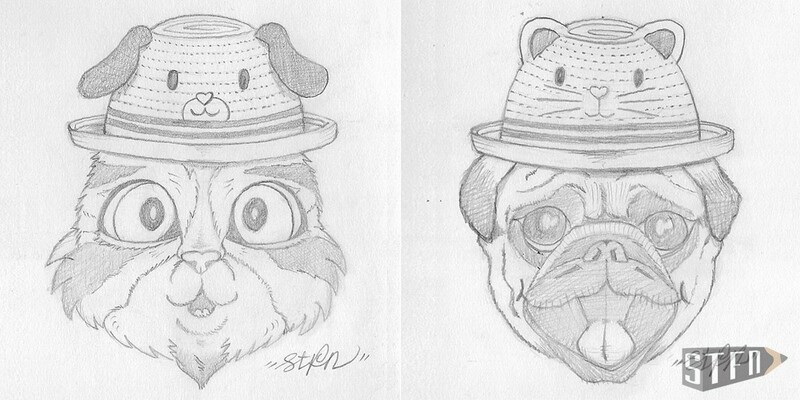 In some cases there were also sweet dog hats, these had the colors beige and reddish brown. Of course these hats are not meant for a cat or dog, although that would not be such a crazy idea. And that’s how the idea came about for a nice drawing. You sometimes find inspiration in the craziest places, as it turns out. Because how would that look? 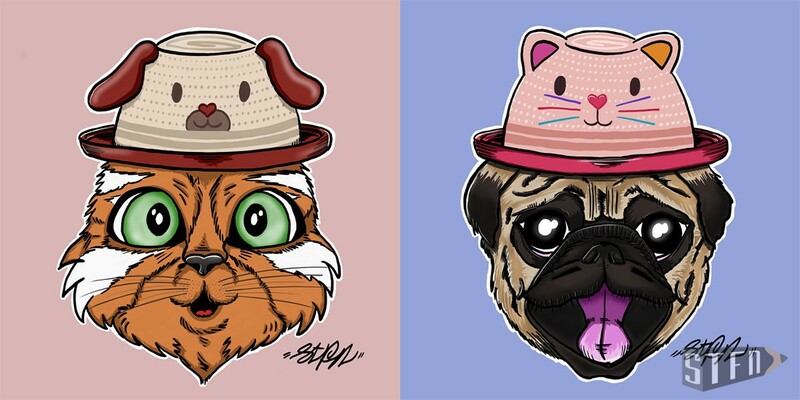 A cat with a dog hat and a dog with a cat hat. Fortunately, I always take my Moleskine sketchbook with me on holiday, including a drawing pouch with pencils, erasers and a brush pen. Once back from the city, I immediately started working on the idea. Then I further developed the drawing in Clip Studio Paint. I have not been using this program for so long, so this provides a nice exercise to get to know Clip Studio better. From the start, the idea was to also be able to sell these drawings via Redbubble, so I already took this into account during the making. It is important to use the correct pixels and resolution (at least 5000×5000 pixels and 300 dpi). I then prepared the drawings for processing on Redbubble. I look at the possibilities for each product. Shall I use a pattern, which background color is suitable, Shall I use a larger or smaller image, etc … The result looks very good, as I may say so. View an example on a T-shirt: Cat or Dog.